As of May 5, 2015, the police in the United States of America have killed 401 people that we know of. 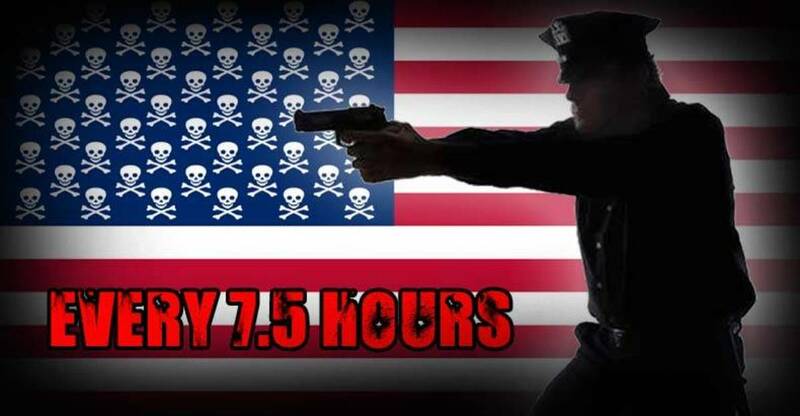 Extrapolating those numbers out to an hourly figure and the police have killed someone on average, every 7.48 hours. While there is no government-run database, Killed By Police has taken it upon themselves to keep track, and are doing a fantastic job thus far. It’s truly a Cop Crisis. The three youngest are A’donte Washington, Jason C. Hendrix, and Kendre Omari Alston who were all only 16-years-old. The oldest was 87-year-old Lewis Becker. At least four officers have also been shot and killed by other officers. Meanwhile, the Officer Down Memorial Page is reporting gunfire related deaths of on-duty officers is down 43%. The death by assault was Patrolman George Nissen, and they are referring to injuries sustained 10 years earlier when he was attempting to break up a large fight on February 13th, 2005. A look at the two which were struck by vehicles, both were accidents, with one occurring while the officer was off duty and had stopped to help someone on an icy road. The other was an accident where a semi truck crashed into the officer’s vehicle. That leaves the eight by gunfire as deaths due to suspects actively attempting to harm them this year. This means that in the 125 days of 2015, the police have been killed after being shot by a suspect, on average, every 375 hours. According to an FBI report, Americans are less violent than ever, yet the police seem to be growing increasingly violent. These numbers seem to agree. Being a police officer isn’t even close to being in the top 10 most dangerous jobs in this country. According to the 2013 report by the Federal Bureau of Labor Statistics on work-related fatal injuries, “Police and sheriff’s patrol deputies” ranked as the 41st most dangerous occupation. Every seven and a half hours our police leave another family planning a funeral. Enough is enough; visit our #solutions section if you’d like to find out some of the many ways we can change this paradigm.